We all can appreciate the feeling of getting far more than what we bargained for – and it is the same with books. When a book arrives and you hold some expectation of its merit and find that your expectations were not only met, but that the book also exceeded your expectations, generates a state of joy. My expectation was to find a sensible translation of one of the many Books of St.Cyprian of Iberian and Brazilian heritage and this I did find – and in excellence in its own right. No matter which one of the Cyprians you set out to translate, the outcome will inevitably be one that invites fragmentation and a book disparate, because this is how these books are experienced by virtue of their nature. The many variations of this book do speak of a constant insistence of providing a collection of magical knowledge useful for the practicing mage, and as the various collectors and authors held different ideas and interest of what would constitute useful knowledge, in the same manner we have several books with the same title, ascribed to the same author, that diverge from one another. My favourite of the Cyprians has always been the collection known as O Antigo Livro de São Cipriano: O gigante e verdadeiro Capa de Aço collected by N.A. Molina, simply because of the amount of material encountered, but it is still a book disorganized in its enormous amount of knowledge adding to the magical arsenal of the mage. I thought some years back to start a translation of this book, but the more I thought about it the more the project became unappealing, because I realized this could not only be about a translation, it also needed a form of presentation and context that I certainly could tie to Quimbanda, but that would restrict the book and its influence in many other streams of the art. In the end I didn’t manage to arrive at a point that enabled the book to become organized in a way that did it justice. There were simply too many angles going on. Leitão has however managed to identify the proper context for the presentation of his translation. And it is quite obvious – the proper route is naturally to pursue the very nature of St. Cyprian, the Faustian sorcerer who converts to Christianity. From this premise Leitão comments in his forward his concerns about the importance of bringing to light the cultural heritage tied in with St. Cyprian and his many books in Iberia. Leitão follows up his promise with providing this book with an astounding translation and then continues with an impressive section of commentaries that are as long as the book he translated. 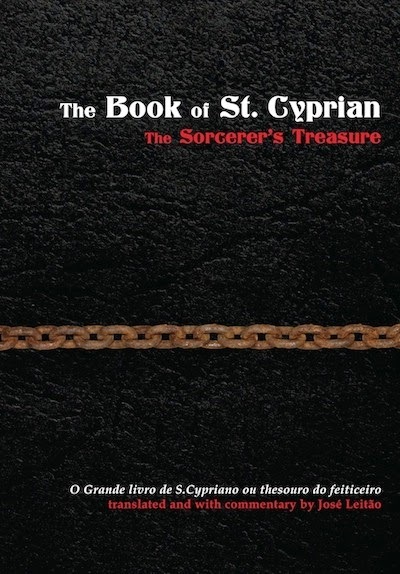 In this section he takes us through the beliefs of the peasant dwellers and rural witches in Iberia and the roots St. Cyprian himself as well as the content of his books in a culture still alive with the memories of the saint and the many formulas found in his books. There is a lot in this section about the sorcerous use of saints – and the Devil as God’s earthly minister flows through this part of the book in a beautiful way that gives so much context to why the books of St. Cyprian are the way they are. It is a tour de force through Iberian witchcraft that casts shadows in the footsteps of St. Cyprian and enables the torch of magic to grow brighter by each turn of the page. Certainly what Leitão describes is a form of folk-Catholicism, but it is done with such sensitivity and loyalty to the saint who has clearly been hovering over his shoulders and filling his ink with a peculiar breath and sight. There is so much in this book that could be commented on that it feels unfair to just comment some parts. This work is impressive in its totality. The research is impeccable, the attention to detail admirable. This is not only a book that takes the legacy of St. Cyprian further, it is also a book that will enrich our understanding of the Western heritage of magic and witchcraft – and in particular the fine, grey and at times diffuse lines between the witch and the magus-priest. Because of this, the book will probably provoke some. Here you will find so many examples of what Andrew Chumbley called dual observance, the worship of both hands where the sorcerer hold hands with the Devil as he placate saints. In this St. Cyprian becomes an icon of the Devil himself – but forged in a very different understanding of who the Devil actually is. But I will not pursue this thick and blood red thread further. There is simply too much to comment on in this book on so many aspects of the art. The book is quite simply a masterpiece endowed with St. Cyprian’s vitality. It is truly a Sorcerer’s treasure. The book can be ordered from Hadean Press here and you can read more about the book itself here.